Pregnancy is a period of increased metabolic demands, with changes in the woman's physiology and the requirements of a growing fetus. Nutritional requirement in pregnancy increases for carbohydrate, vitamins and micronutrients. This combination improves fetal growth and develops immune system. Ferrous ascorbate in this combination has high bioavailability with least GI side effects. Folic acid is vital for cell division and growth. Zinc is essential for many functions, including growth and neurobehavorial development, immune and sensory functions. 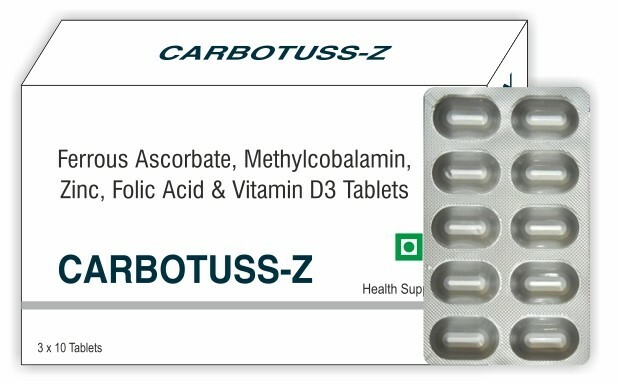 Methylcobalamin together with folic acid, is important in early pregnancy to prevent neural tube defects. Vitamin D maintains proper levels of calcium and phosphorus, which help build baby's bones and teeth. A vitamin D deficiency during pregnancy can cause growth retardation and skeletal deformities. It may also have an impact on birth weight. It is indicated in prophylaxis of iron deficiency especially when inadequate diet calls for supplementary zinc and iron during pregnancy and anemia. Ferrous ascorbate is a synthetic molecule of ascorbic acid and iron. Ascorbic acid enhances absorption of iron. Ascorbic acid reduces ferric iron to ferrous iron, which remains soluble even at neutral pH. Ferrous form is absorbed thrice as much as ferric form of iron. If a pregnant woman has an adequate amount of ferrous ascorbate in the body, it would help her to avoid having an anemia sickness during pregnancy and in addition to that it also boosts the immune system of the mother and the baby.This is the reason why, it is highly recommended that every pregnant woman should start taking ferrous ascorbate especially during the early stages of pregnancy and even before pregnancy. Folic acid is a B vitamin (vitamin B9). It helps to protect your unborn baby from developing neural tube defects. Folic acid may also help to prevent other birth defects, such as a cleft palate. ●	Encephalocele, when brain tissue protrudes out to the skin from an abnormal opening in the skull. That's why it's so important for all women of childbearing age to get enough folic acid — not just those who are planning to become pregnant. Only 50% of pregnancies are planned, so any woman who could become pregnant should make sure she's getting enough folic acid. On mother's side, Folic acid is good too, as it works with vitamin B12 to form healthy red blood cells. Not having enough folic acid can cause you to have a type of anaemia. The other, more common type of anaemia, is due to a lack of iron. Methylcobalamin is a form of Vitamin B12, a vitamin that has strong effects on the brain and nervous system while also being important for cell growth and reproduction. Adequate intake of methylcobalamin is especially important for pregnant women, as a severe deficiency can have disastrous consequences on the developing nervous system of a fetus, yet be difficult to detect. In the body, methylcobalamin is used in a variety of processes, including: the production of red and white blood cells, the regeneration of RNA and DNA, the conversion of fats, carbohydrates, and protein to energy, the synthesizing of proteins and fats, nerve cell and sheath maintenance, methylations (a type of chemical reaction affecting DNA expression), brain function maintenance, choline synthesis, maintenance of epithelial and mucous membrane cells, maintenance of normal bone marrow, and maintenance of a normal gastrointestinal tract. Vitamin D is a steroid vitamin from a group of fat-soluble pro hormones. Vitamin D and pregnancy are important together. Expecting mothers need to make sure they get the recommended amounts of vitamin D during pregnancy for both their own well being and the healthy development of their baby. The most significant compounds for human development are D2 and D3. Vitamin D now has extensive research supporting its role in immune function, healthy cell division and bone health. Vitamin D is necessary for the absorption and metabolism of calcium and phosphorus. Vitamin D invests in the well-being of your baby by supporting healthy bone development. Deficiency with vitamin D is also related to preeclampsia. Vitamin D deficiency is thought to be common among pregnant women, particularly during the winter months, and has been found to be associated with an increased risk of pre-eclampsia, gestational diabetes mellitus, preterm birth, and other tissue-specific conditions. Zinc is an essential mineral known to be important for many biological functions including protein synthesis, cellular division and nucleic acid metabolism. Severe zinc deficiency is rare in humans, but mild to moderate deficiency may be common, especially in populations with low consumption of zinc-rich animal-source foods and high intakes of foods rich in phytates, which inhibit zinc absorption. It is estimated that over 80% of pregnant women worldwide have inadequate zinc intake. It has been suggested that maternal zinc deficiency may compromise infant development and lead to poor birth outcomes. Low plasma zinc concentrations reduce placental zinc transport and may affect the supply of zinc to the fetus. Zinc deficiency also alters circulating levels of a number of hormones associated with the onset of labour, and because zinc is essential for normal immune function, deficiency may contribute to systemic and intra-uterine infections, both major causes of pre-term birth. Low birth weight and prematurity are significant risk factors for neonatal and infant morbidity and mortality. Zinc supplementation may improve pregnancy outcomes for mothers and infants. Constipation; darkened or green stools; diarrhea; loss of appetite; nausea; stomach cramps, pain, or upset; vomiting.